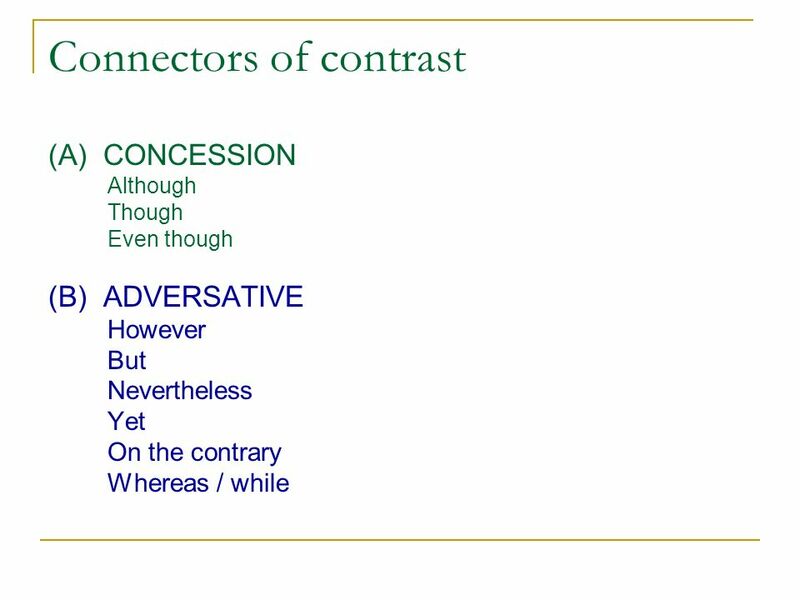 We use although or though or even though to connect contrasting ideas. 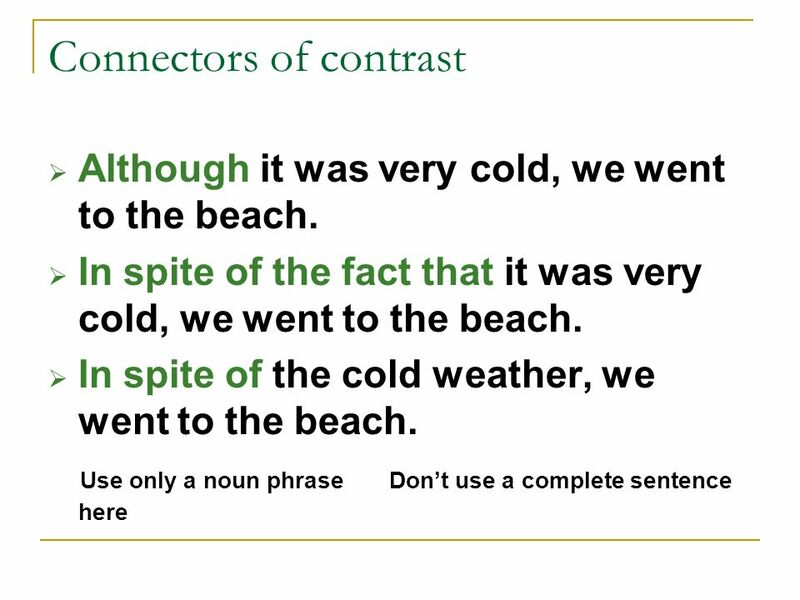 Used to introduce a dependent clause, which is joined to form a complex sentence. 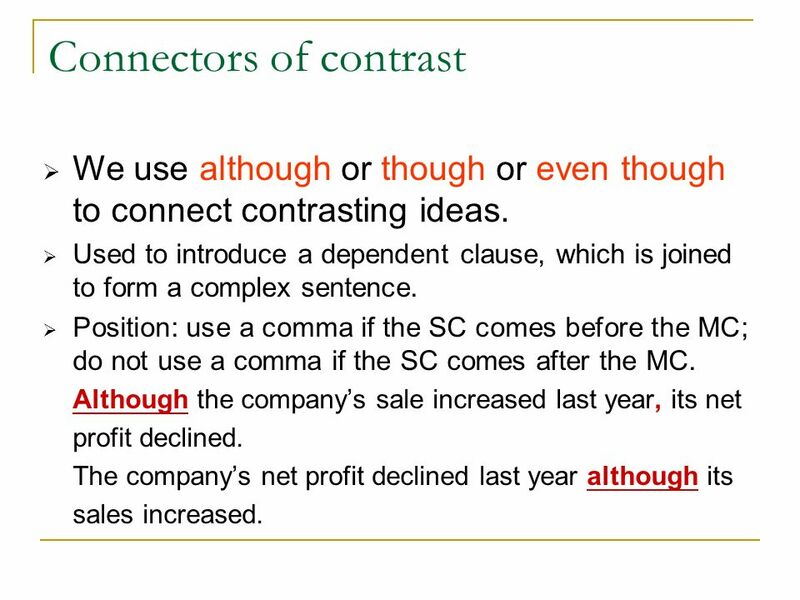 Position: use a comma if the SC comes before the MC; do not use a comma if the SC comes after the MC. Although the company’s sale increased last year, its net profit declined. The company’s net profit declined last year although its sales increased. 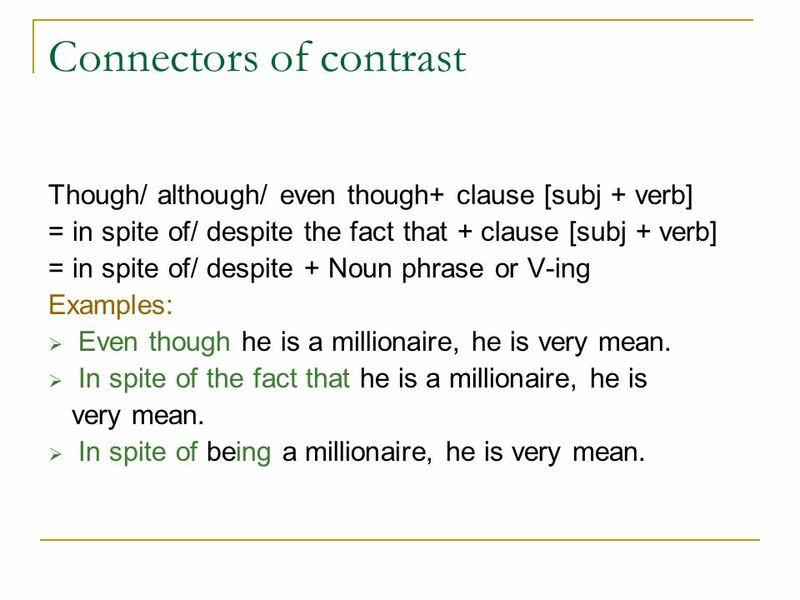 Though/ although/ even though+ clause [subj + verb] = in spite of/ despite the fact that + clause [subj + verb] = in spite of/ despite + Noun phrase or V-ing Examples: Even though he is a millionaire, he is very mean. In spite of the fact that he is a millionaire, he is very mean. In spite of being a millionaire, he is very mean. Although I hate computers, my teacher makes me use them. Despite the fact that I hate computers, my teacher makes me use them. 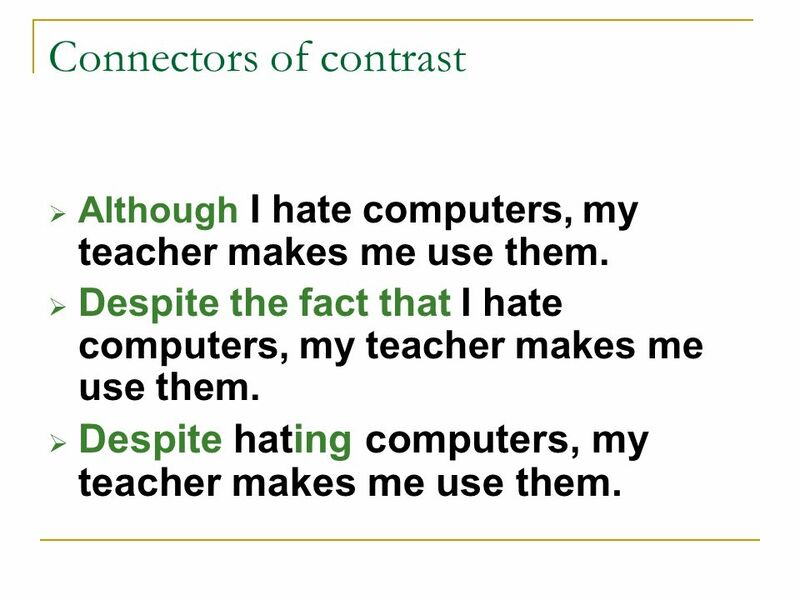 Despite hating computers, my teacher makes me use them. Answer KEY 1) There was a terrible traffic jam. He arrived on time (Although …) Although there was a terrible traffic jam, he arrived on time. 2) He searched everywhere, but he couldn’t find the ticket (Although... Although he searched everywhere, he couldn’t find the ticket. 3) Despite the age of the house, we managed to sell it (Although…) Although it was a very old house, we managed to sell it. 4) Despite the doctor’s advice, he played football last week (Even though…) He played football last week even though the doctor advised him not to do it. 5) Although he has an English name, he is in fact German (Despite…) Despite having an English name/ his English name, he is in fact German. 6) Although her friends advised her not to do it, she would not listen (Despite…) Despite her friends’ advice not to do it, she would not listen. 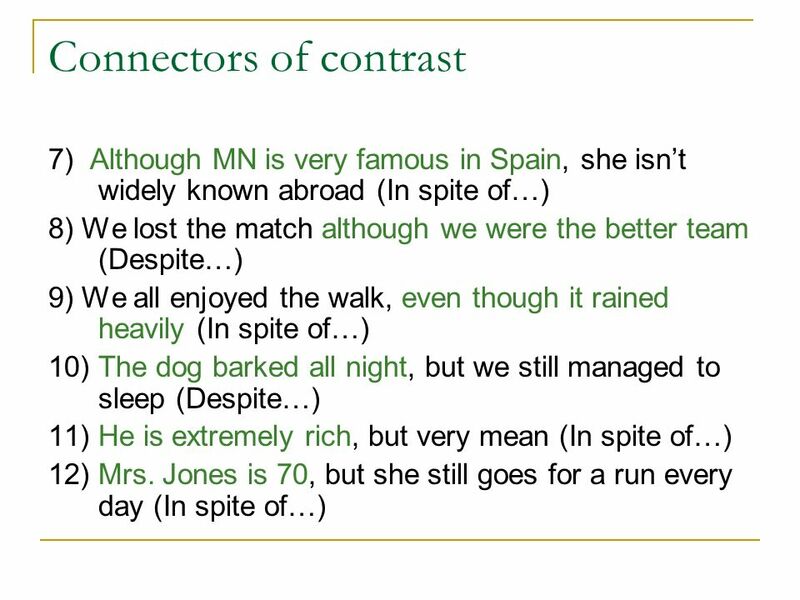 7) Although MN is very famous in Spain, she isn’t widely known abroad (In spite of…) In spite of MN being very famous in Spain, she isn’t widely known abroad. In spite of MN’s popularity in Spain, she isn’t widely known abroad. 8) We lost the match although we were the better team (Despite…) Despite being the better team, we lost the match. 9) We all enjoyed the walk, even though it rained heavily (In spite of…) In spite of the heavy rain, we all enjoyed the walk. 10) The dog barked all night, but we still managed to sleep (Despite…) Despite the dog’s barking all night, we still managed to sleep. 11) He is extremely rich, but very mean (In spite of…) In spite of being extremely rich/ his big fortune, he’s very mean. 12) Mrs. Jones is 70, but she still goes for a run every day (In spite of…) In spite of Mrs. Jones being 70, she still goes for a run every day. 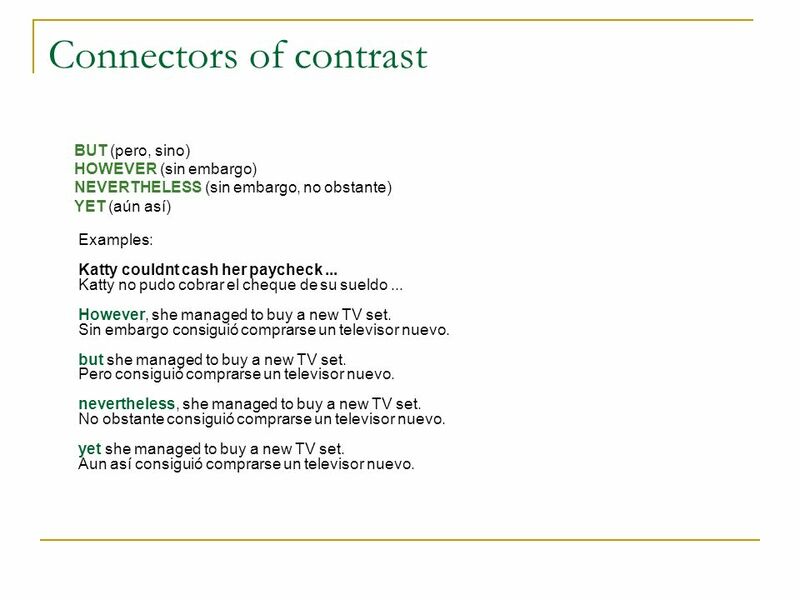 BUT (pero, sino) HOWEVER (sin embargo) NEVERTHELESS (sin embargo, no obstante) YET (aún así) Examples: Katty couldnt cash her paycheck ... Katty no pudo cobrar el cheque de su sueldo However, she managed to buy a new TV set. Sin embargo consiguió comprarse un televisor nuevo. but she managed to buy a new TV set. Pero consiguió comprarse un televisor nuevo. nevertheless, she managed to buy a new TV set. No obstante consiguió comprarse un televisor nuevo. yet she managed to buy a new TV set. Aun así consiguió comprarse un televisor nuevo. HOWEVER ( sin embargo) They were not having fun; however they stayed until the party was over. Ellos no se estaban divirtiendo; sin embargo se quedaron hasta que la fiesta terminó. He doesn't study much; however he gets good grades at school. El no estudia mucho; sin embargo obtiene buenas notas en la escuela. Wrong: I don’t like to use computers, however I have to use them for English class. Correct: I don’t like to use computers. However, I have to use them for English class. Wrong! 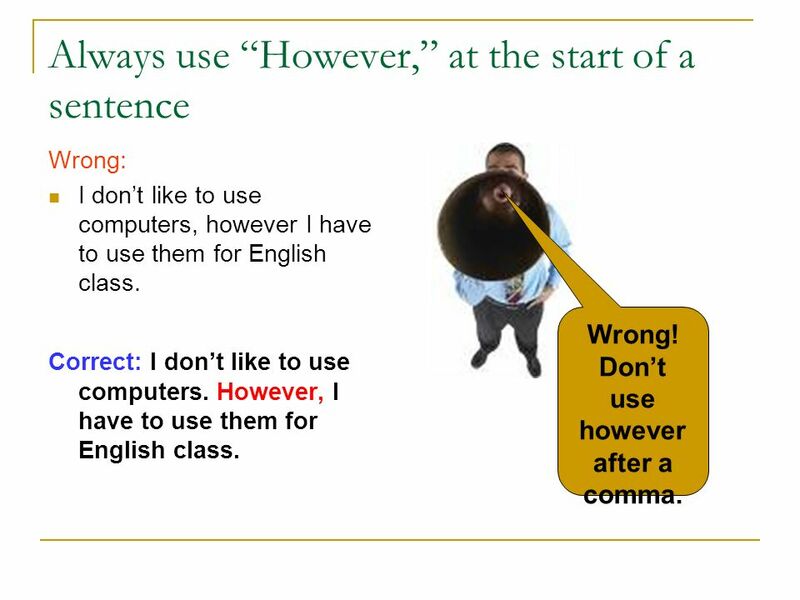 Don’t use however after a comma. NEVERTHELESS ( sin embargo) It was very stormy; nevertheless we went fishing. Estaba muy tormentoso; sin embargo fuimos de pesca. 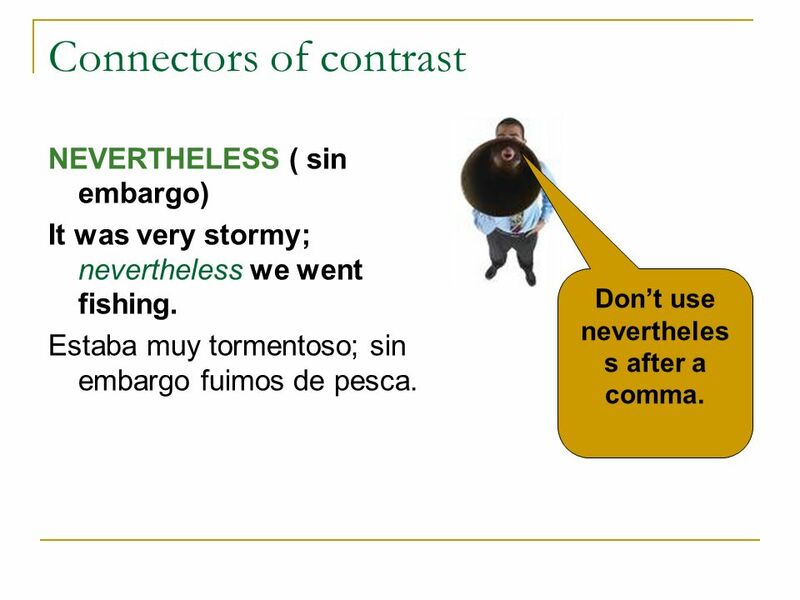 Don’t use nevertheless after a comma. YET - sin embargo He wanted to reply to that accusation, yet he didn't. El quería contestar a esa acusación; sin embargo no lo hizo. Thomas Edison dropped out of school at age 12, yet he became a famous inventor. 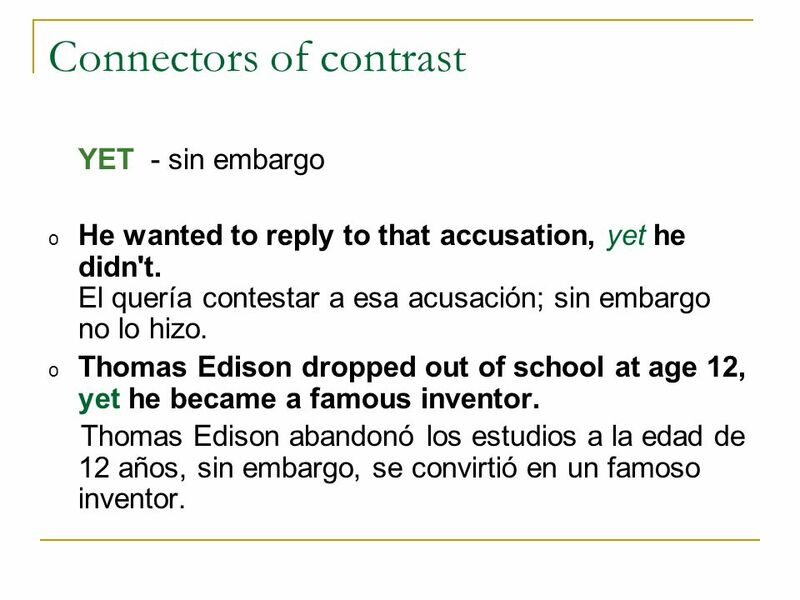 Thomas Edison abandonó los estudios a la edad de 12 años, sin embargo, se convirtió en un famoso inventor. 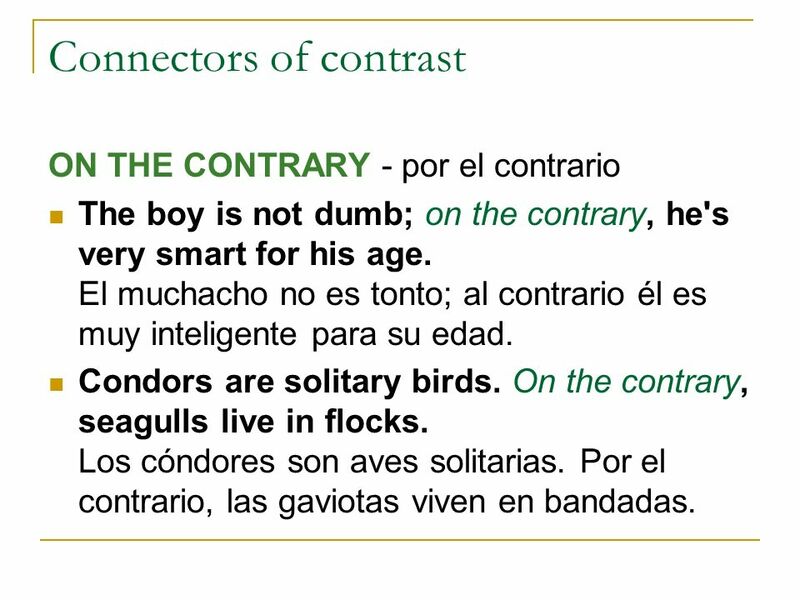 ON THE CONTRARY - por el contrario The boy is not dumb; on the contrary, he's very smart for his age. El muchacho no es tonto; al contrario él es muy inteligente para su edad. Condors are solitary birds. On the contrary, seagulls live in flocks. Los cóndores son aves solitarias. Por el contrario, las gaviotas viven en bandadas. 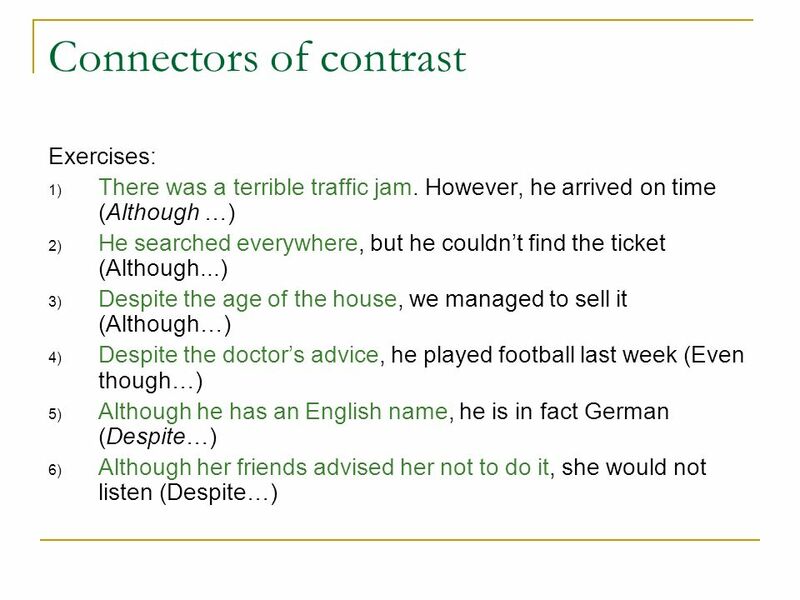 WHEREAS/ WHILE = but on the other hand While and whereas are used to show direct contrast: "this" is exactly opposite of "that." 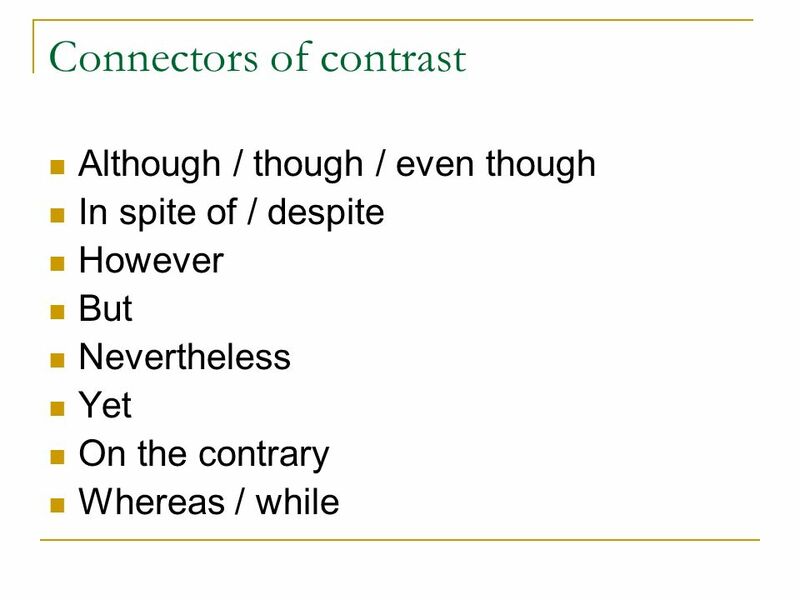 While and whereas may be used with idea of either clause with no difference in meaning. 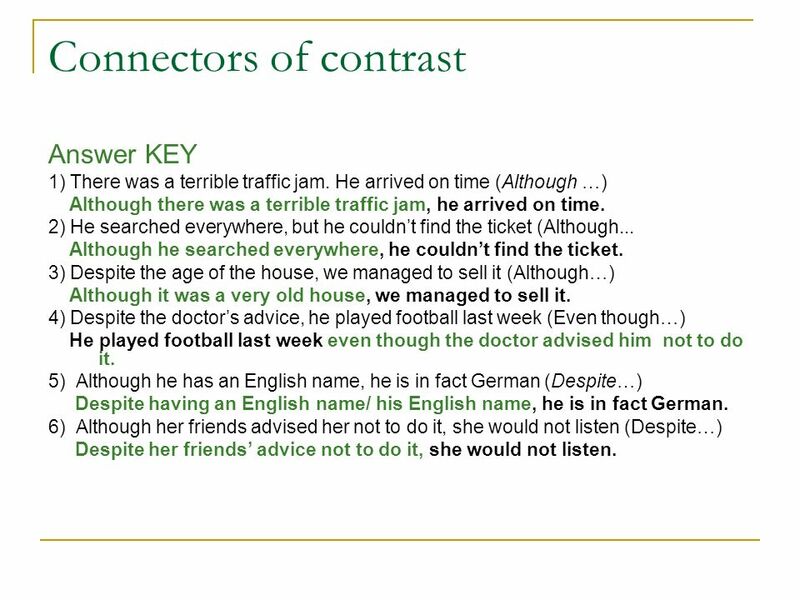 Whereas mostly occurs in formal written English. 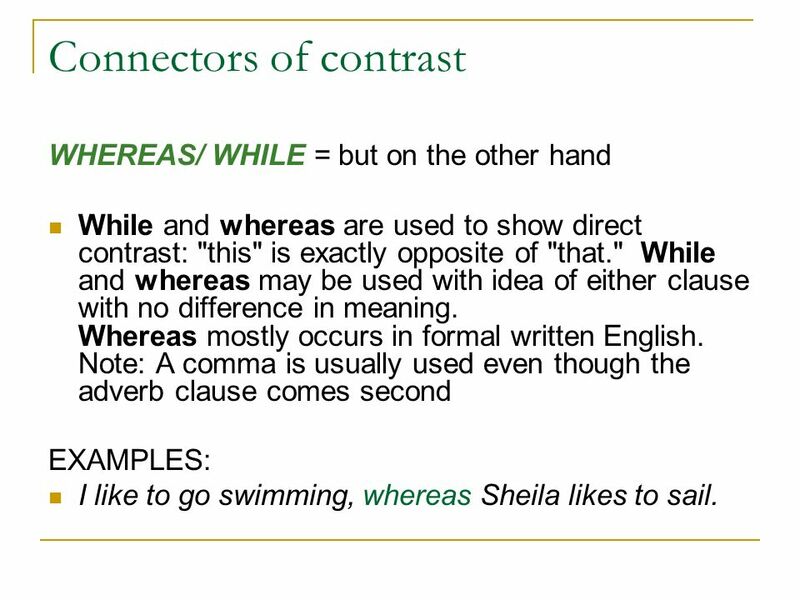 Note: A comma is usually used even though the adverb clause comes second EXAMPLES: I like to go swimming, whereas Sheila likes to sail. One arrived promptly, whereas the others hung back. He is quite shy, whereas his sister is lively and talkative. Mary is rich, whereas/ while John is poor. 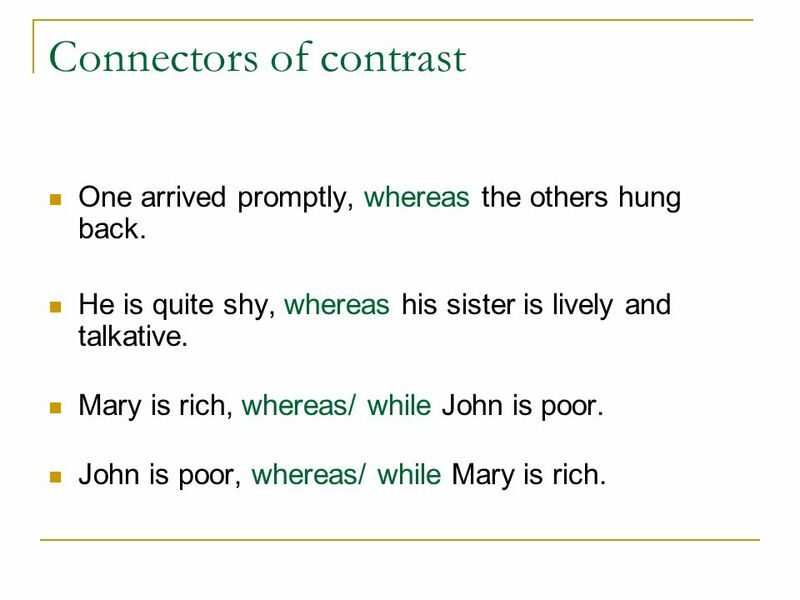 John is poor, whereas/ while Mary is rich. 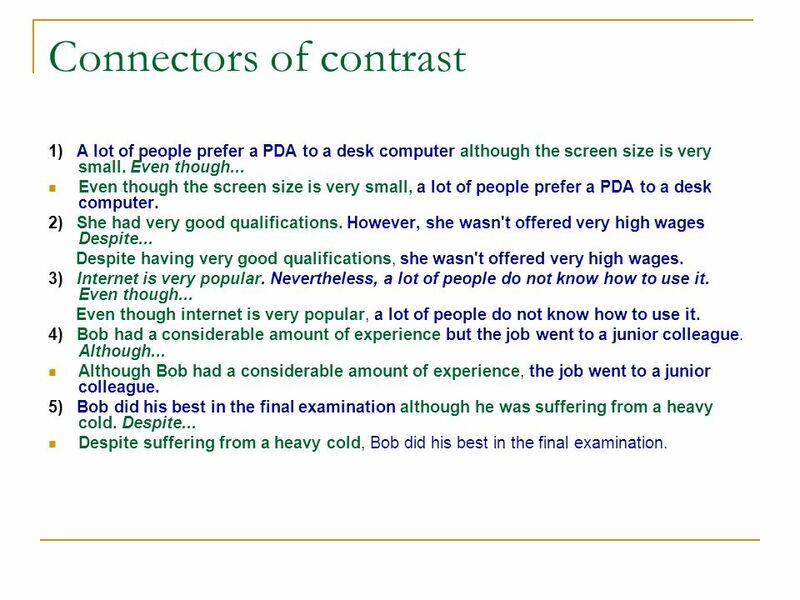 1) A lot of people prefer a PDA to a desk computer although the screen size is very small. Even though... 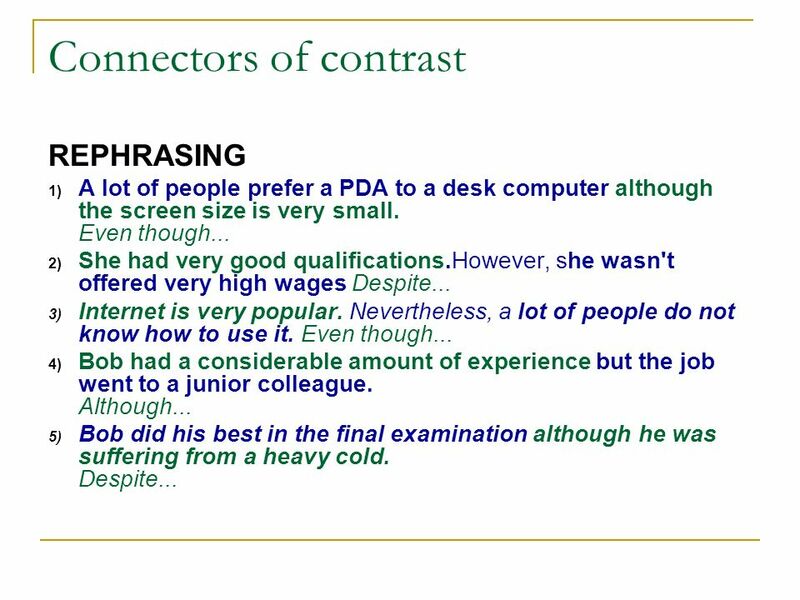 Even though the screen size is very small, a lot of people prefer a PDA to a desk computer. 2) She had very good qualifications. However, she wasn't offered very high wages Despite... Despite having very good qualifications, she wasn't offered very high wages. 3) Internet is very popular. Nevertheless, a lot of people do not know how to use it. Even though... Even though internet is very popular, a lot of people do not know how to use it. 4) Bob had a considerable amount of experience but the job went to a junior colleague. Although... Although Bob had a considerable amount of experience, the job went to a junior colleague. 5) Bob did his best in the final examination although he was suffering from a heavy cold. Despite... Despite suffering from a heavy cold, Bob did his best in the final examination. 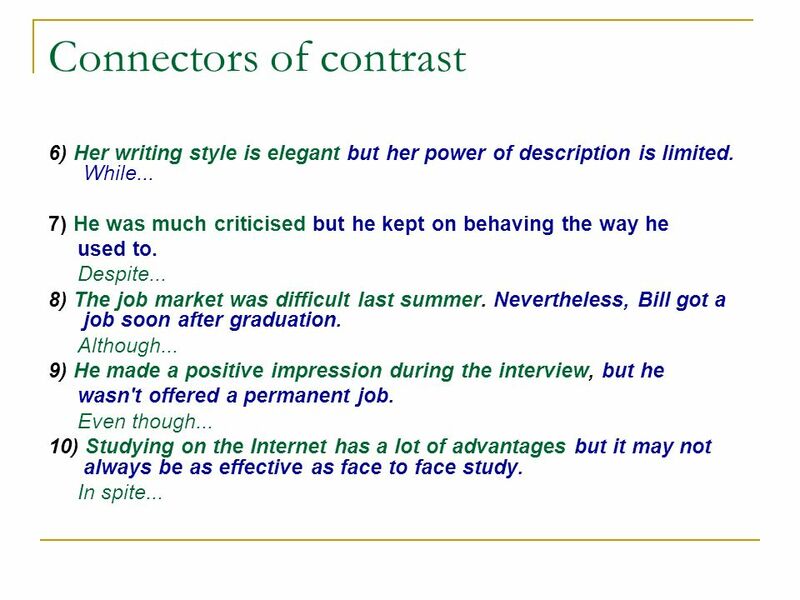 6) Her writing style is elegant but her power of description is limited. While... 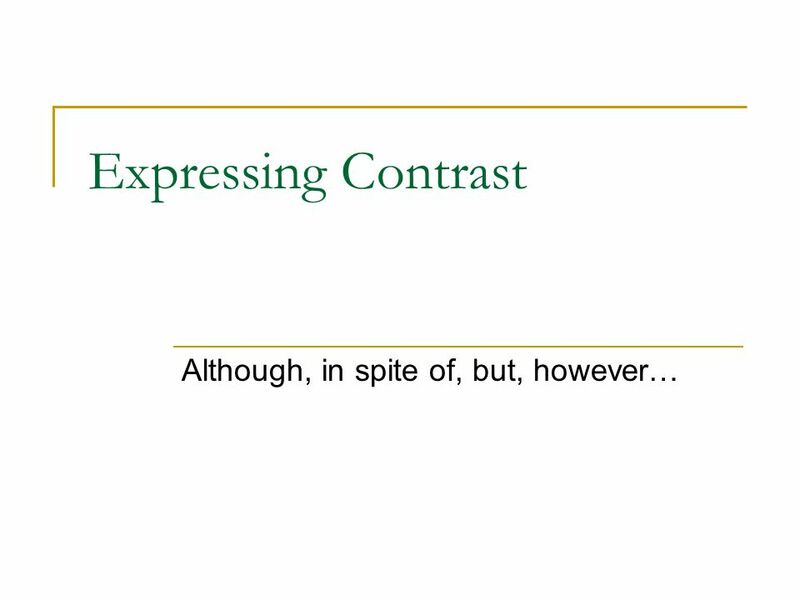 Her writing style is elegant while her power of description is limited. 7) He was much criticised but he kept on behaving the way he used to. Despite... Despite being much criticised, he kept on behaving the way he used to. 8) The job market was difficult last summer. Nevertheless Bill got a job soon after graduation. Although... Although the job market was difficult last summer, Bill got a job soon after graduation. 9) He made a positive impression during the interview, but he wasn't offered a permanent job. Even though... Even though he made a positive impression during tjhe interview, he wasn't offered a permanent job. 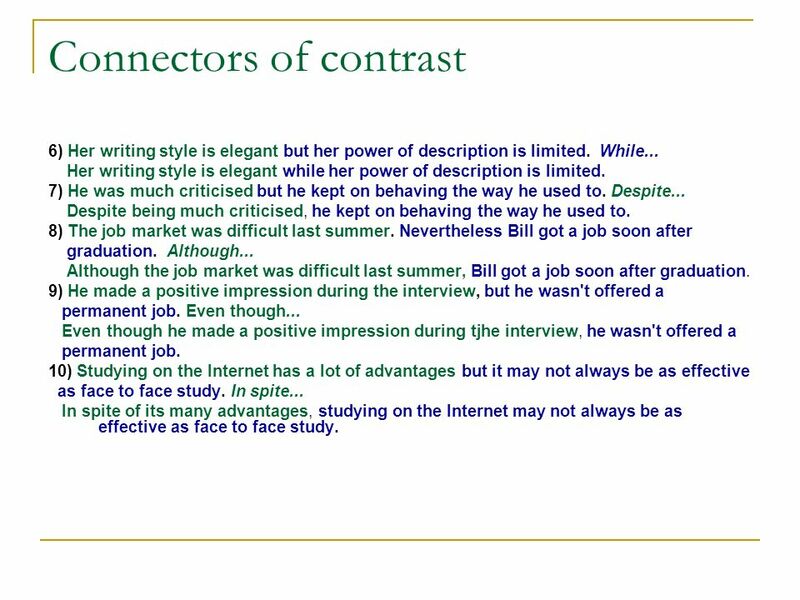 10) Studying on the Internet has a lot of advantages but it may not always be as effective as face to face study. In spite... In spite of its many advantages, studying on the Internet may not always be as effective as face to face study. 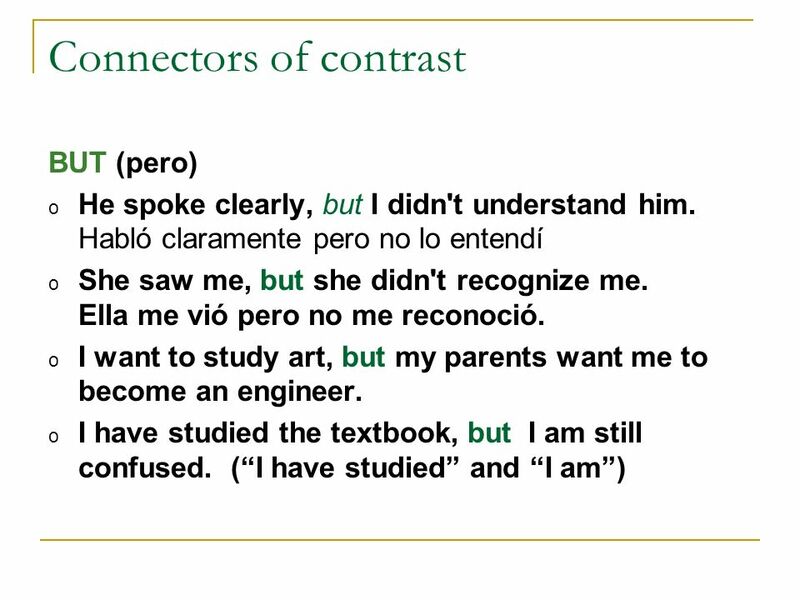 Download ppt "Although, in spite of, but, however…"
Using Connectors by Ilyse Ben Zagmi. S ENTENCE C ONNECTORS EGL 075. 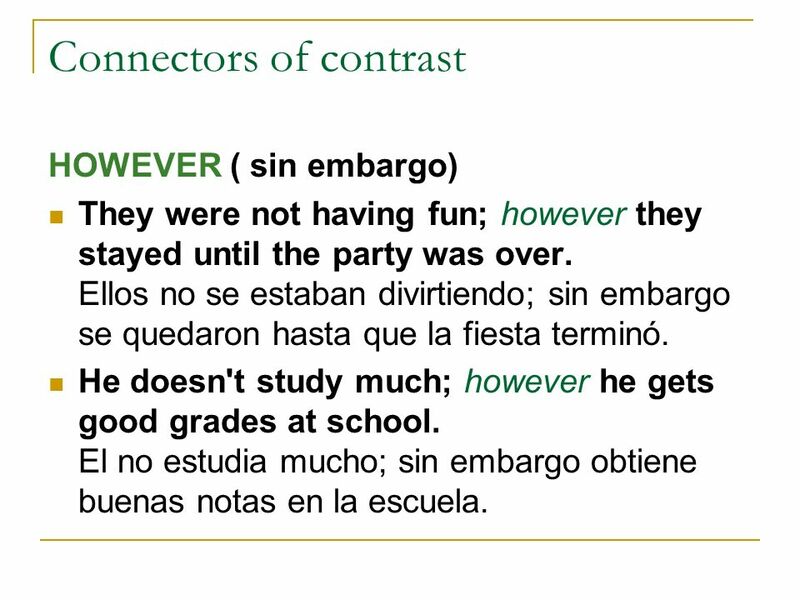 G OOD SENTENCES VS. R UN - ONS Do you remember what a clause is? A group of words that has a subject and a verb. How can. 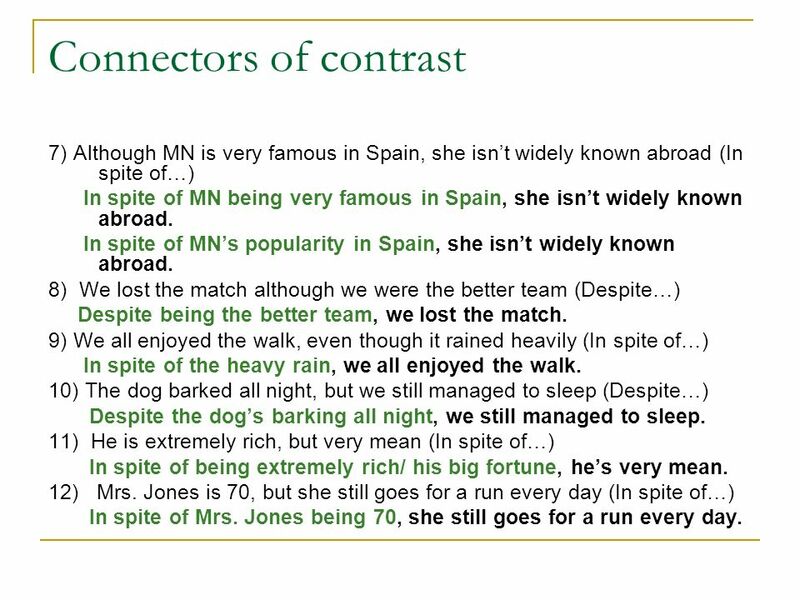 Unit 1: Writing A for and against essay IES Argentona – English Seminar. 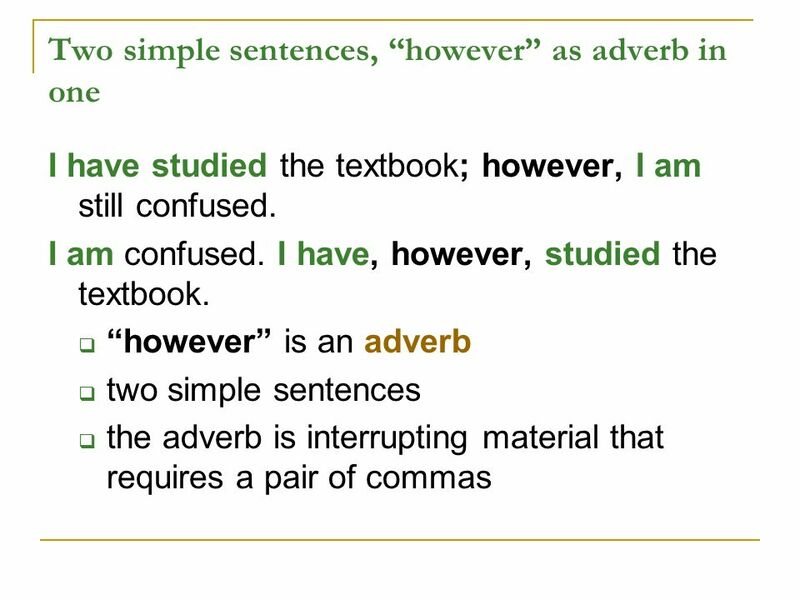 Adverbial Clauses and Phrases Lesson 8. Santa Clause does like to write. NOVEMBER 30, 2015. Announcements This week: Unit 25 and Unit 26 This Wednesday: Listening Quiz This Thursday, Unit 24-26 Test Next Tuesday- Final Exam.